406 pages | 28 Color Illus. | 67 B/W Illus. With the recent development of new experimental approaches and methodologies, it is becoming clear that cells and tissues are not regulated by biochemical signals alone. Indeed, physical cues arising in the biological microenvironment are directly coupled to the biochemical regulation of living systems. This book provides a broad overview of how mechanical forces and properties govern diverse aspects of physiological and pathological processes. It also covers new emerging techniques developed to study complex biosystems such as microfluidics, traction force microscopy, and the development of novel biomaterials for tissue engineering. 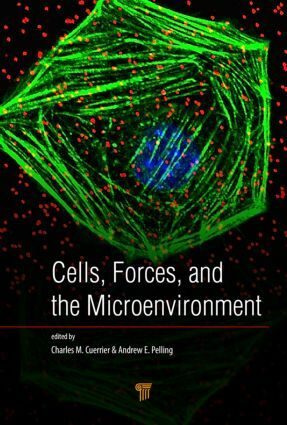 Importantly, the chapters in this book are not limited to applications in animal cell biology but also cover important dimensions in other kingdoms such as plants and bacteria. The aim is to provide a comprehensive overview of the roles that physical cues play in governing diverse forms of life, with an eye on the development of fundamental new knowledge, potential applications in biosensors, and novel biomedical technologies. "This book is an excellent text for the expert or the learner entering the field of mechanobiology. It covers the cues from the forces exerted on cells and by cells to responses to matrix organization and matrix stiffness in how cells grow, crawl, attach, detach, differentiate, and change phenotype. This field is as driven by new techniques as by new data, and this text provides ample information on both with generous helpful use of color figures and a focus on how we understand the most recent key findings." Charles M. Cuerrier received a PhD in pharmacology at the Université de Sherbrooke, Canada. He is currently a postdoctoral fellow at the Center for Interdisciplinary Nanophysics, University of Ottawa, Canada, in collaboration with the University of Ottawa Heart Institute. He is the recipient of a postdoctoral fellowship from the Fonds de Recherche du Québec—Santé and of the Ernest and Margaret Ford Research Fellowship in Cardiology. Andrew E. Pelling received a PhD in physical chemistry at the University of California, Los Angeles, USA, and did his postdoctoral research as a senior research fellow at the London Centre for Nanotechnology, University College London, England. He is currently an associate professor and Canada Research Chair in Experimental Cell Mechanics at the University of Ottawa, Canada. He leads the Pelling Lab for Biophysical Manipulation at the Center for Interdisciplinary Nanophysics, University of Ottawa.